The South Gippsland District Golf Association, Junior Committee has a very active junior program running throughout the District. These programs are run in conjunction with funding grants from the Victorian Golf Foundation. The District owns 2 My Golf kits, 1 of which are utilized at the western end of the District and serving schools in Loch; Poowong; Bena; Korumburra; Leongatha; Tarwin Lower; Inverloch; Wonthaggi through to Phillip Island. The remaining kit is located at Leongatha Golf Club and service schools from Meeniyan; Buffalo; Foster; Fish Creek; Toora & Welshpool. These kits are available for loan to primary schools within the District, free of charge and remain with the school for the duration of the program, generally on a term basis. The District Junior Committee has both a senior training squad for junior golfers aged 14 to under 18 years, and sub-junior training squad for junior golfers aged 10 – 13 years. The squads consist of some 15 juniors under the coaching by P.G.A. golf professionals. The squads are formed on an annual basis, and receive coaching under squad conditions every 4 to 5 weeks. District Clubs may seek to nominate a junior through their club’s junior liaison officer. The squads receive coaching in all aspects of the game, including long & short game, chipping and putting. Both squads are funded through a grant from the Victorian Golf Foundation. The junior pennant season in held throughout February each year. 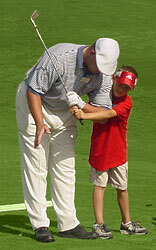 The competition is played under match-play conditions, and is a handicap competition Teams consist of 5 players. With the ongoing assistance of a grant through the Victorian Golf Foundation, the District conducts its major junior event each year in April at Lang Lang Golf Club. Since its inception in 1996, the event has continued to grow and attracts a large field of players from around Victoria. Past winners include Aaron Baddeley, John Sutherland & Ben Meyers, all who have gone onto forge successful professional careers. The 2018 event will be held on Monday 9th April at Lang Lang Golf Club. Both the South Gippsland Junior Classic & the local tournaments held throughout the year are qualifying rounds for the South Gippsland Junior Golfer of the Year award. An annual award is also made for the South Gippsland Rising Star, being a junior who shows potential through his/ her development.